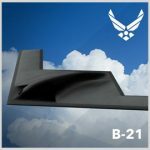 The U.S. Air Force has unveiled the names of seven companies that will partner with Northrop Grumman (NYSE: NOC) to help build a fleet of B-21 Long Range Strike Bomber planes for the military service, Defense News reported Monday. Lara Seligman writes Air Force Secretary Deborah Lee James said in a news briefing at the Pentagon that Pratt & Whitney, a unit of United Technologies (NYSE: UTX), will produce the B-21’s engine technology. The estimated cost for the LRS-B development phase is $23.5 billion and the Air Force plans to buy up to 100 of the B-21s from the Northrop-led team for a total potential cost of $55 billion, National Defense Magazine’s Sandra Erwin reported. Northrop was awarded a cost-plus contract in October to develop the military branch’s future bomber. A team of Boeing (NYSE: BA) and Lockheed Martin (NYSE: LMT) also competed for the contract and protested the award, but the companies’ protest was denied by the Government Accountability Office in February. Boeing and Lockheed have decided not to bring their challenge of the LRS-B contract award to federal claims court.